Home Press Release Welcome to the Grandest Babies & Kids Celebrations Fair in Central Luzon! Welcome to the Grandest Babies & Kids Celebrations Fair in Central Luzon! myTsikiting.com, the newest project of kasal.com, is an online and on-ground platform designed to help loving parents create beautiful events for their precious little ones. 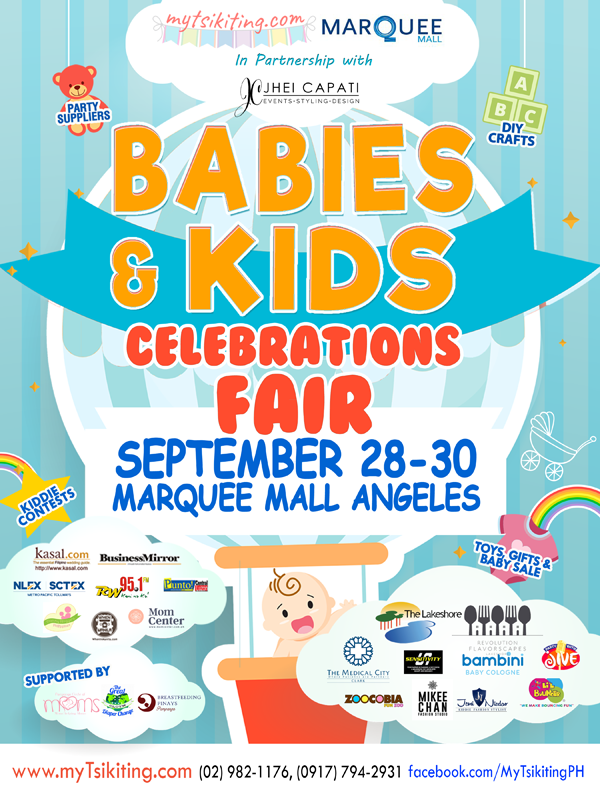 We have been to Subic, Cagayan de Oro, Manila North, and would like to invite you to join our Babies & Kids Celebrations Fair in Marquee Mall, Angeles Pampanga this September 28-30! Our carnival-themed kiddie fair will showcase the beautiful and new event concepts and supplies – from baby showers to baptismals to first birthdays and all the wonderful milestones from kinder to 12 years of age! We also have amazing product showcase for mommies-to-be and their newborns! ...and a whole lot of DIY kiddie crafts and workshops in between. See attached complete program lineup and schedule. Organized in partnership with Ayala Marquee Mall and Jhei Capati Events Styling & Design, the 3-day fair is made possible by Flavorscapes, Lakeshore Events, The Medical City Clark, Sensitivity Lights & Sound, Bambini Baby, Zoocobia, Li’l Bouncer, Party with Jive, Mikee Chan Fashion Studio, Jemi Nicdao Kiddie Fashion Stylist, NLEX-SCTEX, and supported by Breastfeeding Pinays Pampanga, The Great Cloth Diaper Change, and Pampanga Circle of Moms. 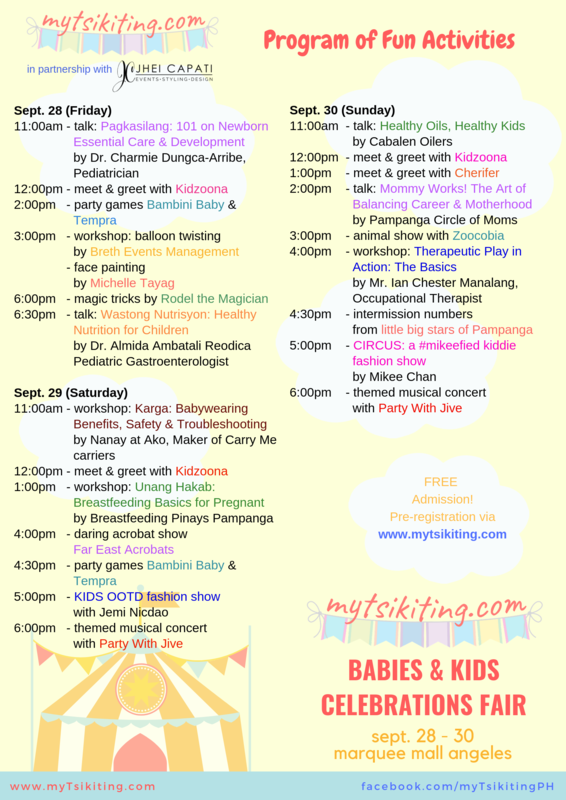 So bring your little ones, even the entire family along, and we’ll ensure you’ll have one fun, learning weekend with myTsikiting.com! Pre-register online to reserve slots for the workshops/programs. Visit www.mytsikiting.com or www.facebook.com/myTsikitingPH for more details. 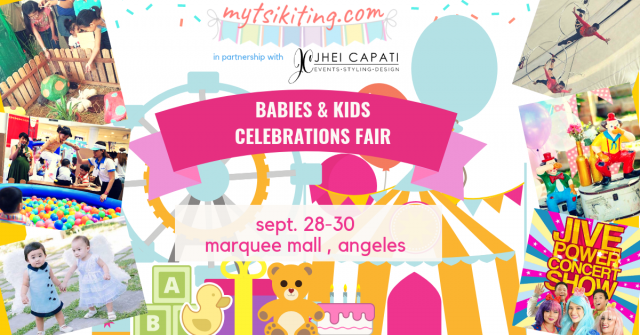 Deemed to be first-ever Babies & Kids Celebrations Fair Roadshow in the Philippines, myTsikiting.com aims to help Mommies/Daddies celebrate their little one’s milestones in the most beautiful, meaningful way. The 2018 roadshow run has been to Subic (Harbor Point Mall) and Cagayan de Oro (Centrio Mall), Manila (Fairview Terraces), and will be going to Angeles (Marquee Mall), and Muntinlupa (Ayala Malls South Park). For more information about this roadshow, please call (02) 982-1176, 0920-9170970, email mytsikiting.com@gmail.com or visit www.myTsikiting.com. Like myTsikitingPH on Facebook.